Intel has announced the availability of new NUC kits powered by the new 'Gemini Lake' Pentium Silver and Celeron CPUs. The new kits feature improved integrated graphics and offer a fair degree of customization to meet specific end-user requirements. Intel has made the 'Gemini Lake'-based 'June Canyon' Next Unit of Computing (NUC) devices available for purchase as per expectations. A total of 4 SKUs are available, which include two NUC kits each based on Pentium Silver and Celeron CPUs, the NUC 7 essential Mini PC, and an NUC board featuring the Pentium Silver J5005 processor. The NUC kits come in two variants — the NUC7PJYH powered by the Pentium Silver J5005 CPU with an integrated Intel HD Graphics 605 GPU and the NUC7CJYH powered by the Celeron J4005 CPU with an integrated Intel HD Graphics 600 GPU. Both NUCs can be fitted with up to 8 GB RAM. HDD or SSD storage can be added to the 2.5-inch drive bay with a SATA 3 port (there's no NVMe PCIe option). These specs mean that these devices should suffice for those looking for a basic computing experience or a no-frills office desktop. Given the fairly capable integrated GPUs, these devices are capable of driving two [email protected] displays via the 2 HDMI 2.0a ports. A TOSLINK optical audio out ensures the ability to output 7.1-channel audio while the dual-array front microphones enable far field reception for Cortana or other digital assistant voice commands. An Intel Wireless AC-9462 with support for Bluetooth 5 rounds off the specifications. The NUCs also offer a fair amount of customization with respect to RAM, OS, and storage. 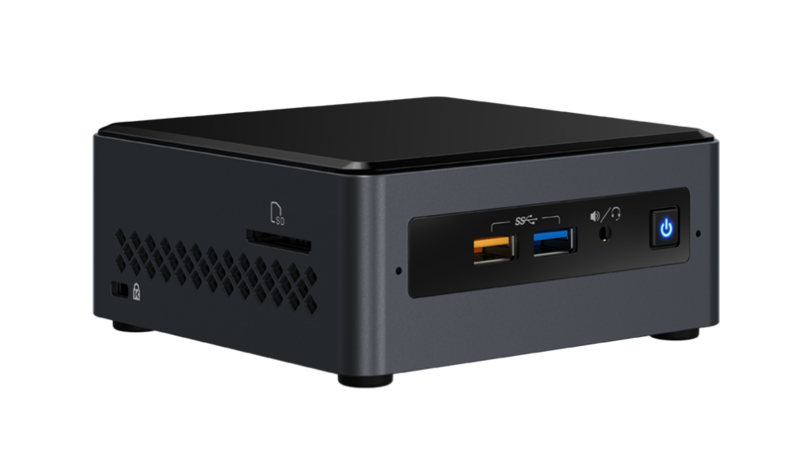 For those who prefer a pre-built system, Intel is also offering the NUC7CJYS Mini PC, which features everything that the NUC7CJYH has to offer and comes in a 4 GB RAM, 32 GB eMMC storage configuration with Windows 10 installed. And for those looking to go all out in customization (save for the soldered CPU, of course), Intel is also making available the NUC7PJYB board based on the Pentium Silver J5005 CPU. With a compact footprint and a range of possible configurations under the hood, NUCs are fast gaining adoption across workplaces. While the NUC concept actually makes sense with low-end CPUs, we've also seen NUC's such as the 'Skull Canyon' sporting the 45W Core i7-6770HQ and more recently, the 'Hades Canyon' NUC featuring the Intel 'Kaby Lake-G' Core i7-8809G with Radeon Vega graphics. The higher end models can be significantly expensive depending on the configuration. The lower-end 'June Canyon' on the other hand, can be a great value for money proposition considering the target workflow.